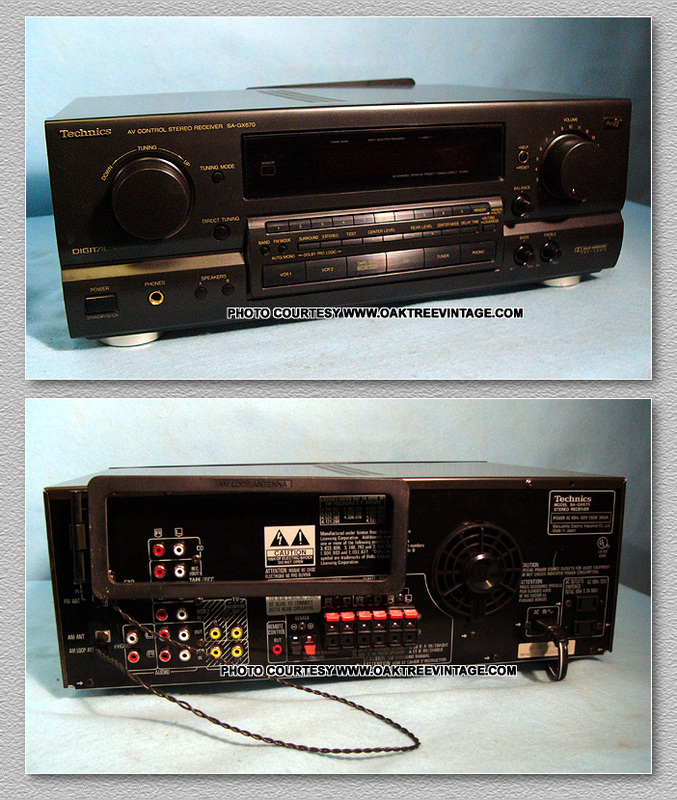 Technics Stereo / Tape deck Parts / spares. 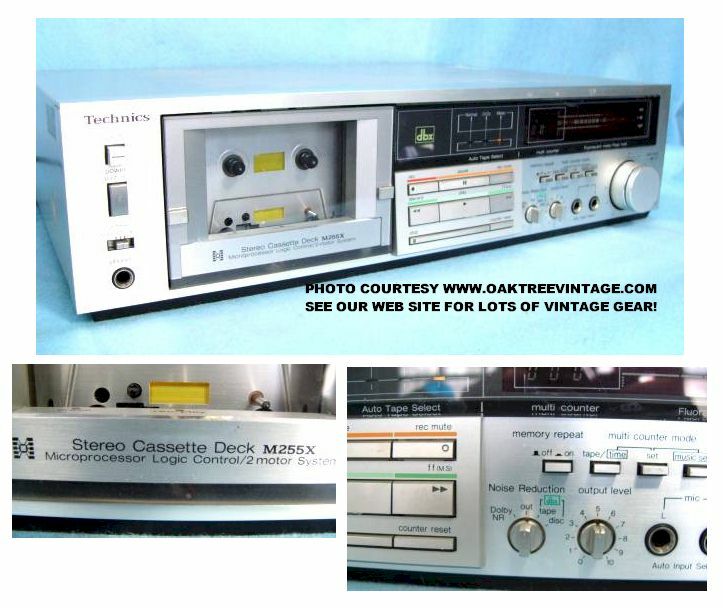 Technics models RS-M68 RS-M255X RS Cassette Deck / Decks Parts for RS-B48R / RSB48R, RS-M205, RS-M228X, RS-TR157, SA-222, SA-5070, SA-5170, Receiver and others. 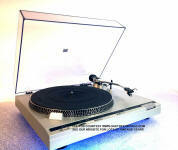 SL Turntable salvage units & electronic parts for electronics technicians, repairs, and restoration. 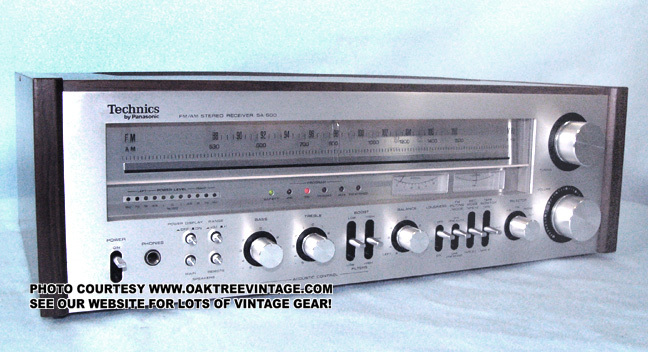 Some parts MAY also fit other Technics SA Stereo Receiver but we have no definitive info. Panel, Face panel with glass and plastic end caps. Good condition - $35. Pointer, Dial pointer - $18. Knobs / Caps / Buttons / Covers / Covers, Volume knob - $25. Knobs / Caps / Buttons / Covers / Covers, Tuning knob - $25. Knobs / Caps / Buttons / Covers / Covers, Round Bass, Treble, Tone / Balance - $20. ea. Knobs / Caps / Buttons / Covers / Covers, Rectangle 'push' caps for Speakers / �FM Muting�, �Loudness�, �Tape Monitor�, 'AUX', 'TUNER', 'PHONO' Push switch caps - $12.50 ea. Knobs / Caps / Buttons / Covers / Covers, Rectangle 'push' caps for �Power� Push switch caps - $20. ea. Switches / Selectors, 'Power' Push switch S-3 TV-3, 3A250VAC, ESB90604T. w/ �clamping capacitor� 103P - $30. Potentiometer / Controls, Bass pot - $20. ea. Potentiometer / Controls, Treble pot - $20. ea. Potentiometer / Controls, 'Balance' pot - $30. transistors / Outputs / Power Amp, Output STK Power Pack, Original *STK4833. Good condition - $30. ea. Circuit Boards, Main Tuner / Power Supply / Amp / pre-amp / 'everything' Circuit board SUP24110A, with variable / tuning capacitor; ECV-5MD34X71G and with IC chips; JRC 4562DD, Mitsubishi AN278, Mitsubishi AN7273, NEC UPC11613C, original / OEM transistors 2SA1015, 2SC1675, 2SC1685, Bridge Rectifier S4VB, Voltage Regulator / transistors 2SD880 (X2), 0.22 Ohm, 470 Ohm, 680 Ohm, 56 Ohm precision resistors and more UPC1161C (less switches, pots, controls, filter caps, heatsink, output chip, jacks, RCA / Antenna jacks) - $45. Circuit Boards, LED Signal Strength / FM Stereo LED indicator Circuit board SUP24110B / GCMK-97X w/ 3x Red LED's and 1x Green LED - $25. Transformer, Power supply Transformer SLT5M185 (ETP66PU18B) (MAL66A15) North American version ONLY - $35. Capacitors, Power supply filter Caps 35V / 6800 uf - $18. ea. Jacks, Headphone Jack with circuit board SUP24110C - $25. ea. AM Ferrite-Bar Antenna - $25. Jacks, AC Convenience Outlets - $20. ea. Panel / Plate, Rear sheet metal panel, less components. � $25. Panel, Face panel with glass. 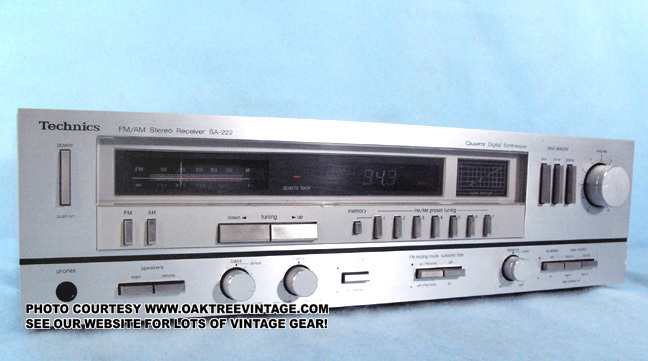 Good condition, with only minor �scratches� on plastic display window (less �Power�, �AUX�, �Tuner� & �Phono buttons). Minor corrosion on integrated �push� caps - $35. Knobs / Caps / Buttons / Covers / Covers, Round Bass, Treble, Tone / Balance, Selector knobs - $20. ea. Knobs / Caps / Buttons / Covers / Covers, Rectangle 'push' caps for Speakers / �Auto Scan�, �FM Muting�, �Loudness�, �Tape Monitor�, Push switch caps - $12.50 ea. Knobs / Caps / Buttons / Covers / Covers, Rectangle 'push' caps for �Power�, �AUX�, �Tuner� & �Phono Push switch caps - $18.50 ea. Switches / Selectors, 'Power' Push switch S-3 TV-3, 3A250VAC, ESB90144T112. w/ �clamping capacitor� 103P - $30. Switches / Selectors, Push switches for Auto Scan / FM Mute / Sub Filter/ Loudness/ Tape 1/ Tape 2 - $20. ea. Switches / Selectors, �FM/AM Allocation� switch / SUP20650C - $20. ea. Switches / Selectors, �Speaker Main� �Speaker Remote� Push switches - $20. ea. Potentiometer / Control pot, Volume Pot M250KΩB - $30. Potentiometer / Controls, Bass pot 14 T - $20. ea. Potentiometer / Controls, Treble pot M 100k, 1 3 L - $20. ea. Potentiometer / Controls, 'Balance' pot M200KG - $30. Meters, AM/ FM Tuning / Signal Meter SSM173-1 - $45. Circuit Boards, Display / Readout Circuit board SUP20650A and SUP20650B Circuit boards, with Fluorescent display / readout, and momentary switches for FM / AM, �Down / UP�, Memory / Presets. Contains IC chips: NEC D4011C / UOY517, LED Signal Strength Display - $45. Circuit Boards, 'Power Supply' / 'Power Amplifier / Driver Boards' Circuit board SUP20590A w/ Rectifier Diodes & balance of components including �Pre-Drivers, and power amp output chip; STK2028*, and 2SD880 Voltage Regulator. 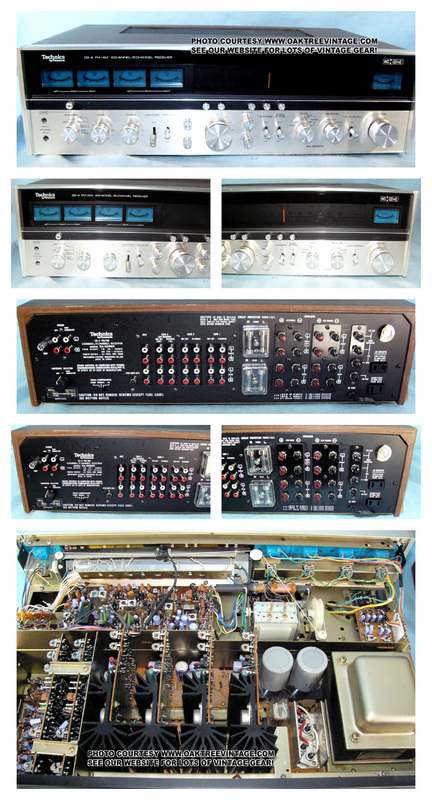 (less switches, jacks, speaker terminals, and large filter capacitors) - $55. Transistors / Outputs / Power Amp, Output STK Power Pack, Original *STK2028. Good condition - $30. ea. Circuit Boards, Tuner Circuit board SUP20610A, with IC chips; Sanyo A1231N, NEC UPC1018C & UPC1161C (less switches, RCA / Antenna jacks) - $45. Circuit Boards, Pre-Amp / Selector Circuit board SUP20610B (less pots & switches) - $35. Circuit Boards, Tone Control Circuit board SUP20610C (less pots) - $25. Capacitors, Power supply filter Caps 45V / 6800 uf - $20. ea. Jacks / Terminals, Speaker Outputs / clips / terminals - $45. Jacks, Headphone Jack with circuit board SUP20590B - $25. ea. Panel / Plate, Rear sheet metal panel, less components.� $25. Feet, Set of 4 feet - $20. SOLD. 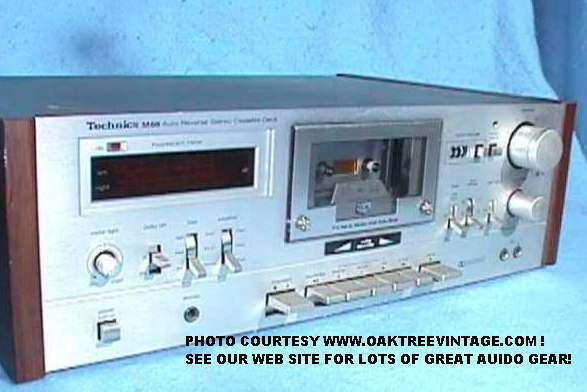 Some parts MAY* also fit other Technics SA Stereo Receiver models such as the SA-400, SA-500, SA-600, SA-700, & SA-800 but we have no definitive info. Panel, Face panel with glass. Good condition, with only minor �scuff� near upper, right corner of window on aluminum. Glass perfect. (less knobs / buttons) - $45. Dial Light �Diffuser�, Plexi-glass lamp diffuser - $30. Sockets, Dial Light / Lamp Socket, - $12.50 ea. Knobs / Caps / Buttons / Covers / Covers, Tuning knob (35mm diameter x 23mm in height. Will NOT fit SA-700, but may SA-400 and SA-500) - $25. Knobs / Caps / Buttons / Covers / Covers, Round 'push' caps for 'Power Display� / Speakers / �Range�, Push switch caps w/ spring - $12.50 ea. Knobs / Caps / Buttons / Covers / Covers, Toggle switch caps for 'Power�, �Boost�, �Loudness�, �FM Muting / Mode�, �Rec Mode� & �Tape Monitor�. - $15. ea. Switches / Selectors, 'Power' toggle / �snap� switch SSLG1. Switches / Selectors, �FM Mute / Loudness� toggle switches / SSL123 - $20. ea. Switches / Selectors, �Record Mode� toggle switch / SSL115 - $30. ea. Switches / Selectors, �Tape monitor� toggle switch / SSL117 - $30. ea. Potentiometer / Controls, Bass or Treble pot 974R / 2x 100k Ohms - $25. ea. Potentiometer / Controls, 'Balance' pot 891G - $25. 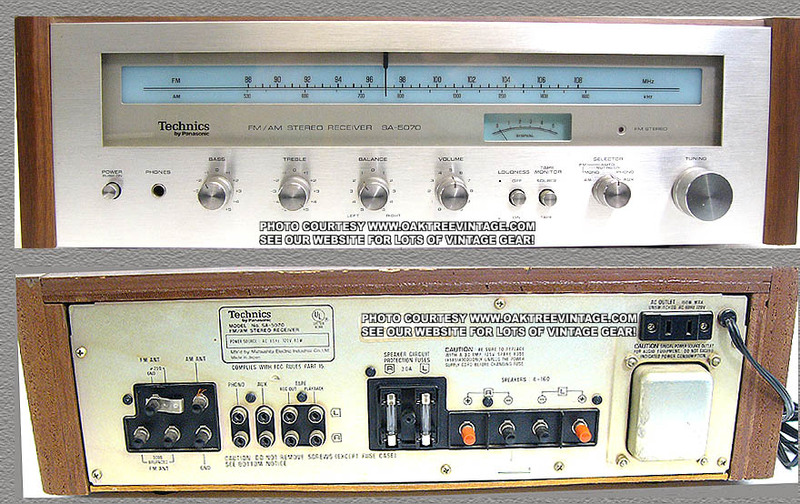 Meters, AM/ FM Tuning / Signal Meter pair - $35. Pulley / String-wheel, plastic string wheel for tuning capacitor - $25. Pointer, Dial Pointer - $15. Circuit Boards, ' Tuner / Main' Circuit board SUP14210A Circuit board WITH tuning capacitor, and AM �Stick� antenna attached. Contains IC chips: Mitsubishi AN217P, AN363N, AN377 and 2SC1398 W/ 5-Gang Tuning Capacitor (less pots & switches, jacks, string wheel) - $45. Circuit Boards, 'Power Supply' / 'Power Amplifier / Driver Boards' Circuit board w/ bridge Rectifier & balance of components including �Pre-Driver� original / OEM transistors, Mitsubishi 2SA913 & 2SC1913 (less pots & switches, jacks, Relay, and large filter capacitors) - $55. Circuit Boards, Circuit board SUP14170C (less switches) - $35. Circuit Boards, Circuit board SUP14170F - $30. Circuit Boards, Circuit board SUP14190 - $30. ea. Heat Sink, (less original / OEM transistors) - $25. Relay, AP39312, 7A / 125-250 VAC, 3A / 30VDC / DC24V - $25. Transformer, Power supply Transformer SLT5Q75 North American version ONLY - $75. Capacitors, Power supply filter Caps 55V / 15,000 uf - $30 ea. Fuse Block / cover, Speaker protection fuse block complete with fuse cover - $25. Panel / Plate, Bottom Panel. Masonite. Less feet. � $25. Feet, Set of 4 feet - $20. 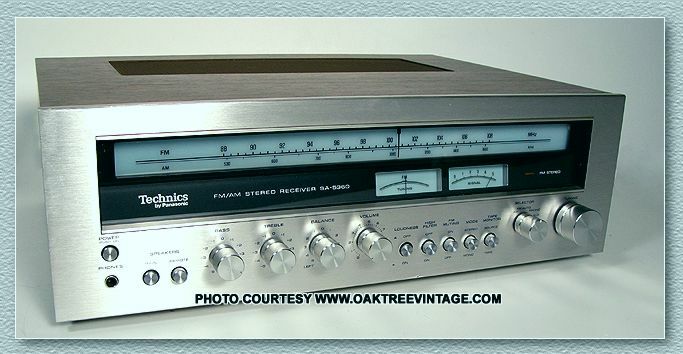 Receiver was parted out due to weak FM tuner. Pre-amp and power amp sections functioned fine. Knobs / Caps / Buttons / Covers / Covers, Round Bass, Treble, Tone / Balance, Selector - $20. ea. Knobs / Caps / Buttons / Covers / Covers, Round 'push' caps �Loudness�, �Tape Monitor�, Push switch caps - $12.50 ea. Knobs / Caps / Buttons / Covers / Covers, Round 'push' caps for �Power� Push switch caps - $20. ea. Switches / Selectors, 'Power' Push switch, Matsushita S-3 TV-3, 3A250VAC, ESB-7086T-671 - $30. 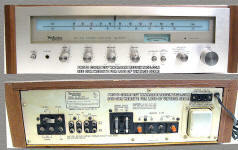 Switches / Selectors, Selector Switch �Loudness� or �Tape Monitor� push switches - $20. ea. Switches / Selectors, Selector Switch �Rack and Pinion Slide Switch�/ �FM�, �AM�, �Auto Muting�, �Phono�, �Aux� �SSR57-1 - $45. Potentiometer / Control pot, Volume Pot 673M1 250K Ohms X2 - $30. Potentiometer / Controls, Bass pot / Treble pot 673M1 100K Ohms X2 - $20. ea. String wheel, Tuning string wheel - $20. Capacitor, Tuning capacitor ECVC751KI44A - $30. Meter, FM �Signal Strength� meter with spring attachment - $20. ea. Fuse Holders, Fuse clip / holder on circuit board SUP 10890C - $20. Transistors / Outputs / Power Amp, Output STK Power Pack / Chip, Original STK-043 �Stereo Amplifier�. Works fine - $30. Heatsink, Output heatsink - $25. Circuit Boards, Main Tuner / Power Supply / Amp / pre-amp / equalizer / Tuner �Front end� / 'everything' Circuit board SUP 10890A, IC chips; AN217, AN363, AN373, 2SA721, 2SC828, 2SC1047, 2SC1383, K83/R176, TA7129P, Rectifier Toshiba ID261, ID2Z1, (less switches, pots, controls, filter caps, heatsink, output chip, jacks, RCA / Antenna jacks) - $45. Transformer, Power supply Transformer SL5N187 (ETP76BU(7B)) North American version ONLY - $35. Capacitors, Power supply filter Caps 35V / 3300 uf - $18. ea. Jacks, Headphone Jack - $25. ea. Reflector, Aluminum dial light reflector - $20. Panel / Plate, Bottom plate / cover w/ feet - $20. photo of SA-5360, a model a couple steps up for reference. 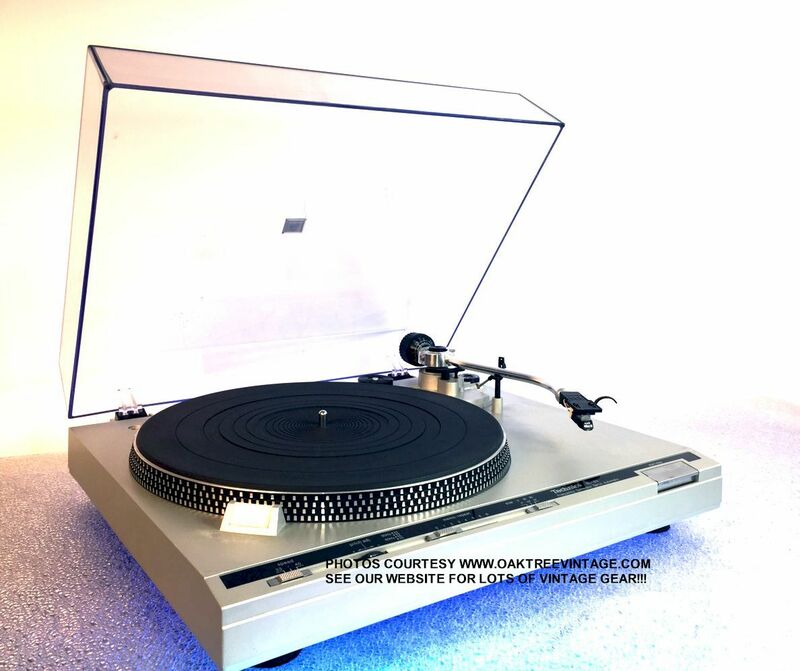 Some parts MAY* also fit other Technics SA models such as the SA-5270 or SA-5360, but we have no definitive info. Panel, Face panel with glass. Good condition, with only minor wear. Glass perfect. (less knobs / buttons) - $45. Knobs / Caps / Buttons / Covers / Covers, Round Bass, Treble, Tone / Balance, Volume knobs - $20. ea. Knobs / Caps / Buttons / Covers / Covers, Round 'push' caps for 'Power / Speakers / Loudness / FM Muting / Mode / Tape Monitor 'Push' switch caps w/ spring - $12.50 ea. Switches / Selectors, 'Power' Push switch. Matsushita S-3-TV35 type 3A250VAC ESB-7086T 572 - $30. Switches / Selectors, 'INPUT SELECTOR' Rotary switch / selector DMS SSR67 MODEL SRL - $40. Meters, AM/ FM Tuning VU Meter trio - $30. Pointer, Lighted Dial Pointer - $15. Circuit Boards, ' Tuner / Main' Circuit board SUP10850A Circuit board. Contains IC chips: Mitsubishi AN217P, AN363, AN377 and original / OEM transistors 2SA721, 2SC828, 2SC1047, 2SC1398, 2SC1675, (less pots & switches, jacks, string wheel & Tuning Capacitor) - $45. Circuit Boards, 'Power Supply' / 'Power Amplifier / Driver Boards' Circuit board w/ bridge Rectifier S4VB, with 'small' transistors; 2SA798, 2SC945, 2SA954, Mitsubishi 2SC828, 2SC1940, 2SC2003, power resistors; 2W 0.022 Ohm, and balance of diodes, resistors, capacitors, chokes / coils (less output transistors, pots & switches, and jacks) - $45. Transformer, Power supply Transformer SLT5N167-W-A - $45. Capacitors, Power supply filter Caps 35V / 6,800 uf - $20 ea. Great looking deck. Lights up. Motors all run. Transport engages, but does not rewind. Tape was playing, but needs transport adjustment in addition to rewind problem as door won't close completely with a tape in upon re-assembly while on the bench. Selling for parts. Email or phone for part needed. Transport sold, but motor and most other parts still in stock. Great looking deck. Lights up. Motors all run. Transport problems and has been partially disassembled internally. Parting out. Email or phone for part needed. Panel, 'Red' Plexi lens for VU meter display - $20. Panel, Front / Face plate with transport control buttons intact. Meter / counter plastic cover / window good with light surface scratches to plexi, and minor nicks around the edges of aluminum but nothing distracting. - $55. Controls, Transport control buttons ONLY as a set. - $35. Knobs / Caps / Buttons / Covers / Covers, Tape Transport / Control / Function buttons - (see listing above under "Controls"
Knobs / Caps / Buttons / Covers / Covers, 'Power' Silver, plastic button on black, plastic, 'push' rod - $25. Knobs / Caps / Buttons / Covers / Covers, 'Rec Mute' Silver, plastic button on black, plastic, 'push' rod - $25. Knobs / Caps / Buttons / Covers / Covers, 'Input Select' Silver, plastic button on black, plastic, 'push' rod - $25. Knobs / Caps / Buttons / Covers / Covers, Noise Reduction Selector Knob - $25. Knobs / Caps / Buttons / Covers / Covers, Output Level Knob - $20. Knobs / Caps / Buttons / Covers / Covers, Eject button - $20. Potentiometer / Control, Input Level Input potentiometer, 20k X2 - $30. Potentiometer / Control, Output Level Input potentiometer, ALPS #QWKGTAO24A14A 10k X2 - $30. Switches / Selectors, Power Switch ALPS TV-3 SDL1P / QSW1117AU - $30. Switches / Selectors, Record Mute, 'Momentary', 'Push' Switch - $30. Switches / Selectors, 'Input / Source' Selector Switch - $35. Switches / Selectors, Noise Reduction Selector Switch - $40. Rod / Wire, Record Switch 'Actuator' rod / wire - $20. Well window, Cassette 'well' plastic cover / window. Light surface scratches to plexi, but nothing distracting. Lower 2/3 Aluminum plate clean as is 'silk screening' - $30. Frame, Door Frame, with 'rack and pinion gear damper' and spring (part that holds the tape and 'hinges' down) - $35. Meters / Display, VU / Rec / PB level meters fluorescent tube mounted to circuit board; QJIM0146NNP IC CHIP: AN6870N, and balance of transistors, resistors, capacitors, diodes etc. - $45. Counter, Tape Counter - $35. Motor, Main capstan Drive motor MMI-6A2LKPA Mitsubishi MMI-6A2LKPA DC 12V (see also Panasonic RS-B10, Panasonic RX-5085, Technics RS-M6, RS-B14, RS-B48R, RS-M205, RS-M218, RS-M226, RS-M228X, RS-M234X, RS-245X, RS-M255X, RS-M263?, and likely many others) - $45. Pinch Rollers / Arms, Pinch roller / arm assembly w/ spring. - $25. Transformer, Power transformer QLPW23ELE / TKP0228-30, on Circuit board - $45. Circuit Boards, 'Main' Circuit board, with Playback Amp, Record Amp, Bias Circuits, Dolby circuits, Gain adjustments, Power Supply 'Filter' components, Record Switch and much more. Includes IC chips; Dolby NE646N, AN6256, M5218L, M5219L, and transistors; 2SA886, 2SA999, 2SC1847, 2SD592, 2SD965, 2SK104, and balance of other transistors, capacitors, resistors, diodes, PC mount 'trim' pots etc. (does not include user switches / selectors, user control pots, I/O jacks). - $55. Circuit Boards, 'dbx NR' Circuit board, QJIM0144NNP. Includes IC chips; dbx 146732, 146742, and transistors; 2SC949, 2SD51010, and balance of other transistors, capacitors, resistors, diodes, PC mount 'trim' pots etc. - $45. 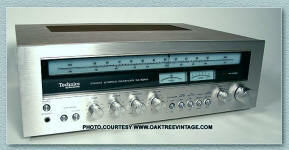 Switch, Power Push Switch, SDL1P / TV-3 - Reference info ONLY. Not currently available from this menu. Circuit Board, Input / Balance Potentiometer Circuit board QJIM0182NNP - Reference info ONLY. Not currently available from this menu. Circuit Board, Main Circuit board QJIM0177NNP, w/ transistors; 2SB941, 2SD1265 & IC; Dolby Chip NE635N / K8309, Dolby Chip NE654N, M5220L, M5218L - Reference info ONLY. Not currently available from this menu. Circuit Board, Circuit board QJIM0174NNP w/ transistors & IC; dbx Chip AN6391, M5218L - Reference info ONLY. Not currently available from this menu. Circuit Board, Power Supply Circuit board QJIM0173NNP - Reference info ONLY. Not currently available from this menu. Transformer, Power Supply Transformer, QLPW26EKC / 48A-024NP - Reference info ONLY. Not currently available from this menu. Jack / Circuit Board, Headphone Jack / Circuit board QJIM0176NNP - Reference info ONLY. Not currently available from this menu. Great looking deck. Lights up. Motors all run. Transport problems in that a tape will run, with some internal manipulation, but as soon as you go to stop and try and start again the tape won't travel, unless you again manually start it inside. Problem unknown. 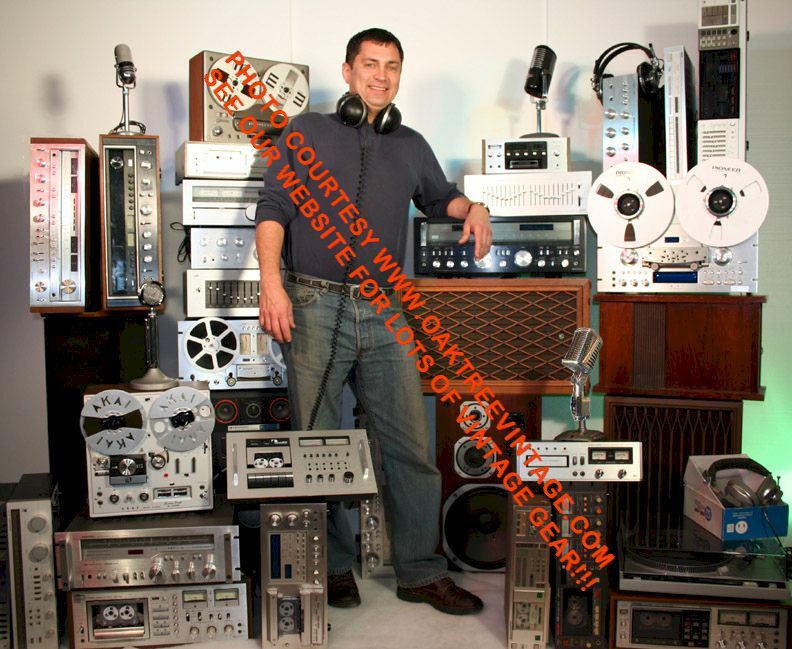 Features Dolby, DBX, Digital counter, Fluorescent meters, IC Logic tape controls and much more. Selling as is and complete for repair or parts. Panel, �Front / Face panel�, w/ display / meter window. Minor scuffs, small edge dings (less transport, controls, meters, buttons, switches, jacks / plugs, sold separately) -$35. Panel, Aluminum �Transport� function panel / overlay -$25. Panel, Aluminum end trim / cap for right side of face panel (minor scuffs) - $20. Panel / Display, Futaba QSIFL013F Fluorescent tube readout �record level� display on circuit board#QJIM0214NNP PWB-D with transistors 2S115, 2SC2320, IC AN6870N and balance of board mounted capacitors, resistor, diodes - $45. Circuit Board, �Main� Circuit Board, PWB-A, #QJIM0211NNP with transistors: 2SA124, 2SA933, 2SA1309, Mitsubishi 2SB941, 2SC114, 2SC945, 2SD1225, Mitsubishi 2SD1265, 2SD1275, 2SD1468,2SJ40, 2SK3ZA, 2SK81, 2SM21, Mitsubishi 2SA921, Mitsubishi 2SD1011, horizontal package Mitsubishi M5218L, Mitsubishi M5220L, IC AN6270, AN6271, dbx AN6291,TEA0665 Dolby chip, MN1405RMS with balance of board mounted resistors, capacitors, diodes, small variable resistors, adjustable core transformers (less jacks / connectors, slide pots, switches / selectors, headphone and microphone jacks / connectors - $65. Circuit Board, �Control� circuit board, PWB � C #QJIM0213NNP, includes transistor 2SM11, LEDs green, red, yellow, white, momentary switches with other board mounted resistors, (counter sold separately) - $40. Circuit Board, �Forward�, �Reverse� switching circuit board #QMIM0216NNP .OWB-E (switches sold separately) - $30. Counter, 3 digit with pulley - $20. Knobs / Caps / Buttons / Covers / Covers, �Power� cap (switch, switch extension sold separately) - $20. Knobs / Caps / Buttons / Covers / Covers, �Input�, �Balance� slider / linear fader pot cap (input slider pot sold separately) - $18. ea. Knobs / Caps / Buttons / Covers / Covers, �Timer� slider switch cap (input slider pot sold separately) - $18. ea. Knobs / Caps / Buttons / Covers / Covers, �Power switch �extension�, plastic (power switch sold separately) - $15. Extensions, �Tape selector� / NR / DOLBY / DBX switch �extensions (less switches & caps sold separately) - $15. ea. Knobs / Caps / Buttons / Covers / Covers, �Transport Mode� switch caps, gray plastic - $15. ea. Knobs / Caps / Buttons / Covers / Covers, �Eject� button- $20. Knobs / Caps / Buttons / Covers / Covers, �Transport� buttons / caps (charcoal, red, orange) - $12. ea. Switches / Selectors, �Power� push switch SDL1P TV-3 4A/32A250V (cap / button, extension sold separately) - $25. Switches / Selectors, �Reverse Mode� Forward / Reverse push switches (selectors, caps / buttons sold separately) - $25. ea. Switches / Selectors, �Timer slide switch (less cap / button) - $20. Potentiometer / Controls, �Record level�, linear fader potentiometer 50Ka (less extensions, cap sold separately) - $25. Potentiometer / Controls, �Balance� linear fader potentiometer, 40t 100kw (less extensions, cap sold separately) - $20. Transformer, Power Transformer, HIKARI MUM052-2 QLPP61ELX with circuit board #QJIM0212NNP PWB-B - $45. Transport, �Transport� w/ heads (less motors) - $45. Motor, Capstan Motor Mitsubishi MMI-6A2RK, DC 12V, CW - $35. Motor, �Fast Wind� Motor Mitsubishi MMI-6C2LKE, DC 10V - $35. Motor, �Transport� Motor Mitsubishi MMI-6C2LKC, DC 8V - $35. Jack / Connector, RCA Input / Output connectors / jacks 2 pair set - $ 25. Jack / Connector, �Microphone� � inch jack - $25. ea. Jack / Connector, �Headphones� � inch jack - $25. Panel, �Front / Face panel�, plastic, matte black / black (less transport, controls, counter, meters, buttons / caps, switches, bay doors all sold separately) -$35. Panel / Door, Cassette �Bay / Well Door� �Deck 1� or �Deck 2� - $20. ea. Dampers / gears, Cassette �Bay / Well Door� dampers - $15. ea. Counter, Tape counter - $25. Knobs / Caps / Buttons / Covers / Covers, �Record level� caps / knobs (pots sold separately) - $15. ea. Knobs / Caps / Buttons / Covers / Covers, Black, Plastic �Eject Buttons� - $15. ea. Switches / Selectors, �Timer� Record / Off / Play �slide switch� on circuit board #RJBOO36AD ( buttons / caps sold separately) - $20. Switch / Selectors, �Power� locking push switch on circuit board #RJBOO36AE (less button / cap) - $20. Circuit Board, �Main� Circuit Board, #RJBO138B with transistors: 2SA114, 2SA1309, 2SB1357, 2SB621, 2SB1030, 2SC114, 2SC3311, 2SD592, 2SD1450, 2SD2037, 2SJ164, IC AN7351K, AN7384, Mitsubishi M50746-145SP, Philips TEA0657 / DOLBY NR chip, with balance of other board mounted resistors, variable resistors, adjustment transformers, capacitors, diodes (less filter capacitors, jacks / connector, voltage adjuster, AC socket) - $55. Circuit Board, �Display� / �Record Level� circuit board # RJBOO36AA with #LN261478PH-90 LEDS for record level, tape direction, DOLBY, deck 1 / 2 and transistors: 2SA114, IC AN6888 and balance of board mounted capacitors, diodes, and resistors (switches sold separately) - $35. Circuit Board, Deck-2 �Control� circuit board, #RJB0036AB with transport controls / tactile / momentary switches; �Play�. 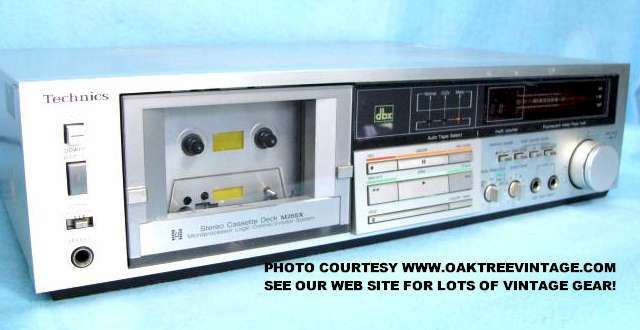 �Stop�, �Cue / Rewind�, �Pause�, � Record�, �Reverse Mode�, �DOLBY�, �Record Level� pots (less front / display panel, buttons / caps, bay doors) - $45. Circuit Board, Deck-1 �Control� circuit board, #RJB0036AC with transport controls / tactile / momentary switches; �Play�. �Stop�, �Cue / Rewind�, �Record Level� pots (less front / display panel, buttons / caps, bay doors) - $25. Transformer, SLT5K254K KK II3 adjustable voltage with connection pins - $35. Heads, �Playback� head #H4C 35GYA 91210 - $30. Head, �Record / Playback head #003 - $35. Transport / motor, MMIM-5B2LWNI DC 12V - $35. ea. Transport assembly, Less motors / heads - $35. ea. Jack / Connector, RCA Input / Output connectors / jacks 2 pair panel - $ 25. Jack / Connector, �Remote� / �Syncro-Edit� 1/8� jack / connector - $15. ea. Panel, �Rear�, sheet metal (less connectors, outlets) - $20. Socket / Jack, �AC� socket / jack /connector 2 pin input to main circuit board - $25. CORD, �AC� molded 2 pin, black �Figure-8 / Infinity�- $20. 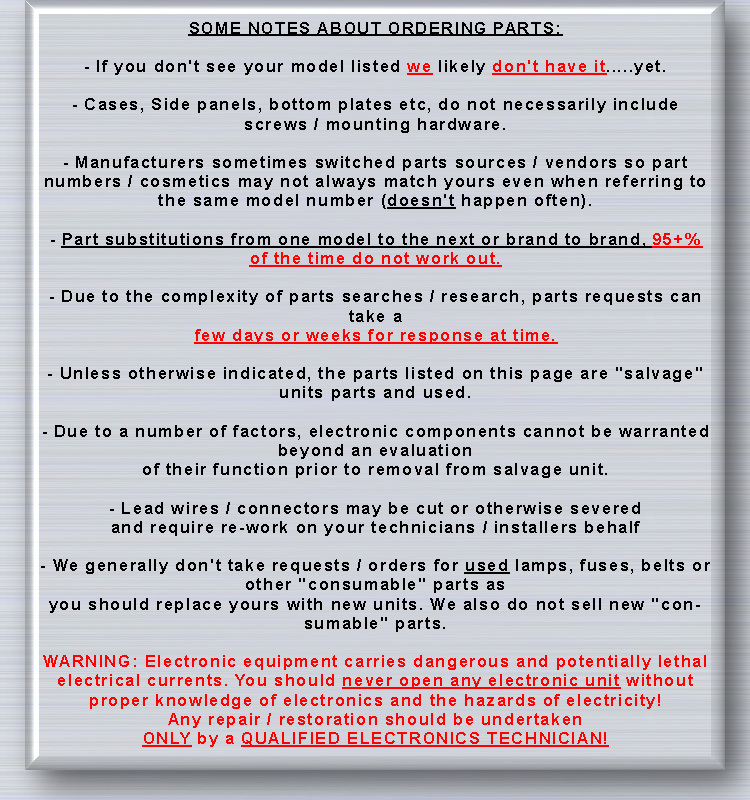 SOME PARTS MAY BE INTERCHANGEABLE WITH OTHER TECHNICS "
PART NUMBER / CROSS REVERENCE INFORMATION ONLY!!!! Motor, Motor, Mitsubishi DC12V, MMX-3H2RPA - Reference info ONLY. Not currently available from this menu. 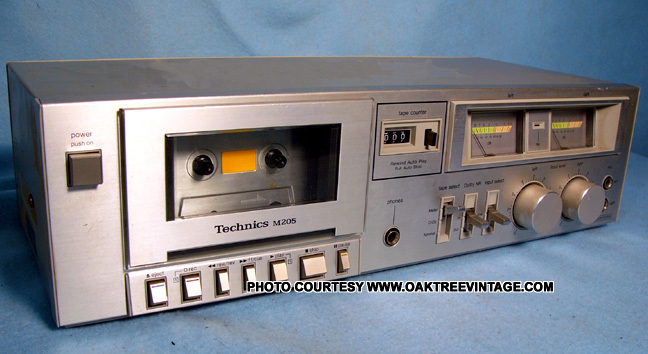 Technics RS-M255X Cassette Tape Deck; The one we serviced came out great, but was not one of the easier cassette decks to service. Fairly involved and most serviceable assemblies 'buried'. To remove the tape well door / window, grasp at the bottom edge and pull. It is firmly held in by two 'horizontal' plastic 'barbs' (most tape door / windows simple 'push-up' to remove). We were not able to 'readily' obtain a main capstan belt, however the currently installed belt was in very serviceable stated, so we 'reconditioned' it. We completely removed the tape transport to access the belt. We also removed the first couple of 'layers' from the front of the transport to gain access to the reel / hub drive tires. The tires were removed from their wheels, and reconditioned. This also allowed access to clean most of the moving parts of the transport of old lubes, and re-lube. At this time we also reconditioned the pinch rollers, prior to reinstalling the transport assembly. There are two ways to access the input fader / pots for cleaning. Either by removing the entire front panel and 'meter / switch section' or by removing the bottom sheet metal, then lowering the main circuit board. The latter is probably the easiest in hindsight. Meter level adjustment pots are VR-301 & 302. The face panel must be removed to access the capstan motor speed control which is in the rear of the motor, but since they designed the transport 'stupidly' with the motor facing 'backwards', you can't get to the adjustment without removing the face plate. 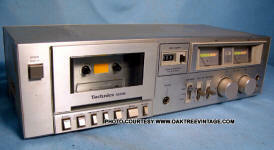 The entire service took about 8 hours including completing the balance of what we typically do to cassette decks. That could probably be reduced by a couple of hours knowing the above 'tricks and tips'.